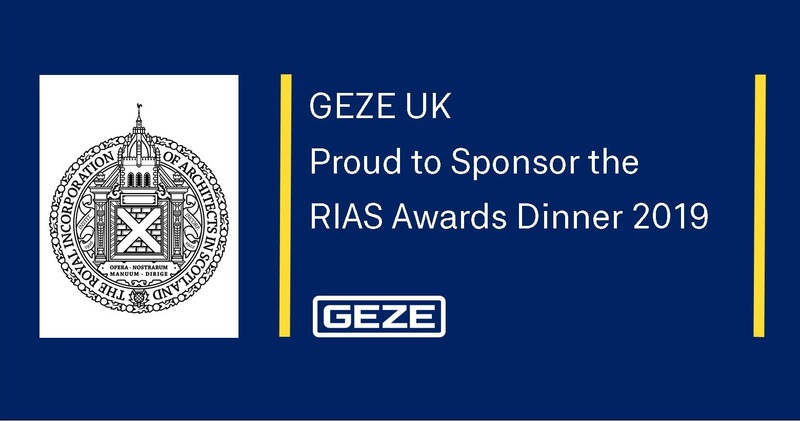 GEZE UK is to sponsor the prestigious Royal Incorporation of Architects in Scotland (RIAS) Awards Dinner for the fifth consecutive year. The glittering event, showcases the best of Scottish architecture and will take place at The Assembly Rooms, Edinburgh, on 30 May. A total of 82 entries have now been shortlisted to 19 projects which must go head-to-head in order to win accolades for architectural achievement. Said Andy Howland, GEZE UK sales and marketing director: “It is always an honour to be part of the RIAS Awards which presents an eclectic range of projects within a variety of landscapes and created to accommodate very different requirements. The 2019 Awards will be decided by an esteemed panel of judges including: Prof. John Cole CBE Hon FRIAS (Chair), Joanna van Heyningen OBE RIBA, van Heyningen and Haward Architects (representing the Royal Institute of British Architects), Catriona Hill from CH Architecture and Peter McCaughey, WAVEparticle.